Evolution series garbage disposals are the world's most advanced food waste disposers. From the powerful induction Motors with cutting edge grind Technologies to the top-of-the-line sound reducing Technologies, the evolution Essential XTR food waste disposal unit delivers quality. Essential XTR garbage disposals also give you something extra - an included sink top switch and a power cord - providing exceptional function and additional convenience -- a perfect solution for a wide variety of kitchens. InSinkErator ESSENTIAL-XTR Evolution Essential Garbage Disposer, 3/4 HP. With two-stage grind technology, the InSinkErator Evolution Essential is able to grind everything from artichokes to rib bones. SoundSeal Technology delivers Quieter performance allowing you to hold a conversation with elevated voices in the same room. MultiGrind Technology delivers two stages of grind and allows you to more efficiently grind difficult food items like bones. 3/4 Horsepower Dura-Drive Induction Motor is engineered to specifications used for appliance motors, provides quiet operation and long life. HP: 3/4 40% quieter than standard disposer 40 oz. Stainless steel grind chamber and components for durability Soundseal technology delivers quieter performance allowing you to hold a conversation with elevated voices in the same room Stainless steel grind components Removable quiet collar sink baffle Dura-drive induction motor Includes sink top switch cord kit. While we aim to supply accurate product information, it is sourced by manufacturers, suppliers and marketplace sellers, and has not been provided by Overstock. Store: eastbaygreen2012 Condition: Brand New Price: $249.99 Total Price: $249.99 Buy It from eastbaygreen2012 No returns. 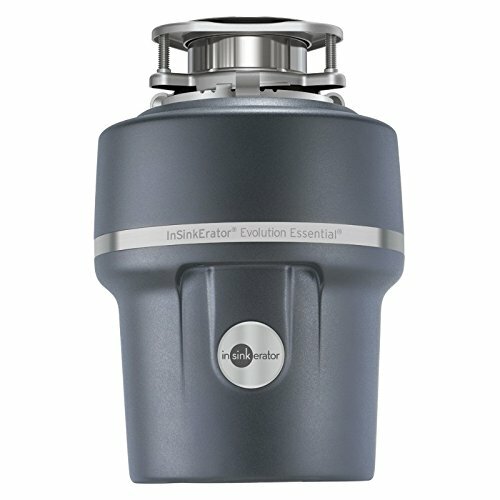 InSinkErator Evolution Essential XTR Garbage Disposal w / Cord & Sink Top Switch -- Free 1-3 Day Delivery With Hassle-free, 30-day Returns! Coupon Details: Get $34.02 OFF automatically when you add this item to your cart! Regular price of $299.00 will be shown prior to adding it to your cart.